I have a theory about the lineage origins of Ichang papeda, Yuzu, and Ichang lemon, which are all probably related. I believe there was probably an original cold-hardy papeda species, similar in morphology to Ichang papeda, that has now been lost. This original cold-hardy papeda species naturally hybridized with sour mandarin and grew wild in the mountainous interior region of China. This resulting citrus is what the Japanese would later call Yuzu, after the fruit was brought to Japan during the Tang dynasty. Usually producing seed that were clones of the parent, there probably were several interbreeding events that mixed up the genes, making them more uniform and stable, so that Yuzu became like a species. I believe that Yuzu (it might not be the same cultivar type we know today) may have hybridized again with its original ancestor papeda species resulting in the Ichang papeda. I believe it likely that Ichang papeda crossed again with Yuzu resulting in the Ichang lemon. Or possibly a primitive Ichang lemon. This Ichang lemon was then identified by humans and selectively bred for bigger size and more pulp. I do not want to speculate too much but one thing I think might be possible, the original lemon could have been crossed with an orange, and then the new lemon, which closely resembled the original, was selected as the more desirable one and repeatedly propagated from seed (possibly until its genes became stable). 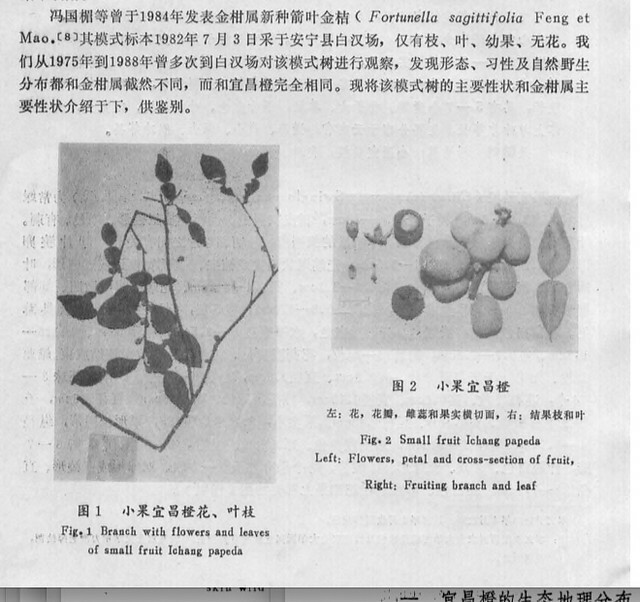 It is very unlikely a pomelo would have been available in this colder mountainous region of China, so if there are any pomelo genes in Ichang lemon they most likely would have had to come through some sort of orange or orange-mandarin (these type of Citrus unshiu × Citrus sinensis fruits were very common and China and Japan and could be more cold hardy than orange). However, if Ichang papeda were crossed with yuzu, and then crossed with orange, one would presumably expect the color of the resulting Ichang lemon to be much more orange than it is. There are other hybridization possibilities of course, but I do not think any of them to be too likely. Maybe if the mandarin genes in the original lemon got suppressed from several sexual events (while it was growing in the wild) it could then have been enough papeda-like to later cross with another mandarin-dominant variety without taking on an orange coloration. Or the orange could have been backcrossed into the lemon over two generations. If the resulting Ichang lemon was superior to the previous, the old variety may have simply been discarded, no longer grown by the people living in that area. Why do I believe this? There was a genetic study done in Japan that showed a very strong connection in Ichang papeda to having a yuzu ancestor (although the presumption was not conclusive). Genetic studies show that Ichang papeda seems to contain a fair amount of C. reticula in its DNA (or DNA markers that correspond to the species mandarin). That wouldn't be the case if Ichang papeda was its own original species, like many sources seem to assume, and makes it more likely Ichang papeda was descended from Yuzu, rather than vice versa. In DNA comparison, Ichang lemon does show more affinity for pomelo than mandarin, to provide full disclosure, and Ichang lemon did cluster closely with Hyuganatsu (thought to be a pomelo-yuzu hybrid) in one DNA marker plot. Now I am wondering if perhaps Ichang lemon came not directly from pomelo but instead a pomelo-yuzu hybrid crossed with something else, perhaps Ichang papeda. 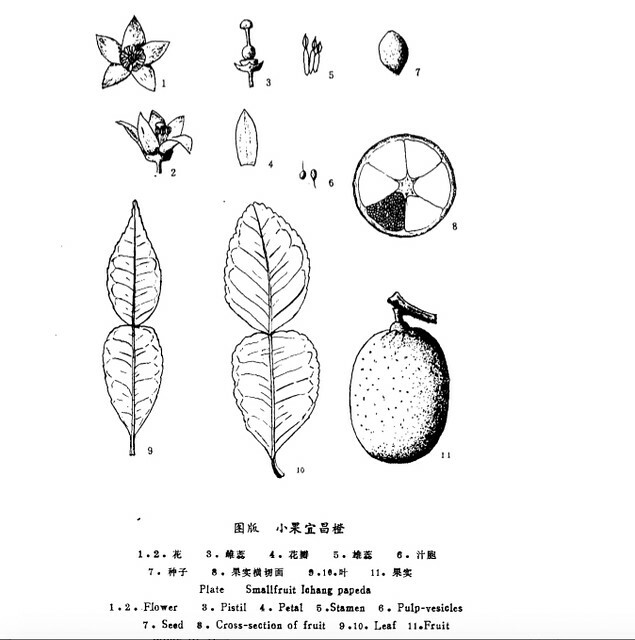 Perhaps a Chinese-style "grapefruit" (mostly pomelo DNA) that had some distant yuzu ancestor and was known to be cold-hardier than other similar type fruits, was brought into a mountain village where it had the opportunity to hybridize with Ichang papeda. Or perhaps Ichang papeda had been cultivated into a more fleshed variety, useful for cooking, and over time it got crossed with a pomelo-like fruit to make it more useful, so the Ichang papeda we know today are only those ones that had escaped into growing in the wild before pomelo genes were bred into the lineage. I bet any of the citrus varieties can, could , would , should have pollinated with any other citrus varieties to make whatever hybrids/ varieties we see in cultivation or wild in the woods today. Ichang varieties can live where pomelo and grapefruit and mandarins live whether the interbreed took place in a south FL climate or a SC climate. I think we've all figured out that citrus other than poncyrus, which also lives in FL, doesn't survive in zones colder than zone 8 without protection in winter. Sounds like a question of which came first, the chicken or the egg? I miss some links to scientific studies mentioned in the post. I doubt Yuzu a cultivated species could be ancestral to a wild species like Ichang Papeda. Mikkel, the document is not public: "Your authentication to this fulltext delivery has expired. Please go back and try again by logging back into the site and requesting the document." Another possibility, Yuzu and Ichang papeda may be more like siblings, with varying amounts of C. reticula in their ancestry, Yuzu having much more than Ichang papeda. I think it very likely that both of them grew naturalized in the wild, before Yuzu came under human cultivation. But the original C. reticula probably escaped from human cultivation in the first place, I would think. Of course the actual lineages could easily have been more complex than that, if these mixed populations were growing in the wild for a long time. We might not know the lineages exactly but I think it is safe to say we have a good idea what their first ancestors were, and in roughly what ratios their ancestry is.